Discussion in 'Disney at the Movies' started by SpectroPluto, Apr 17, 2002. I checked for the song on Dogpile (to see if it's ever been mentioned in a website), on Google (to see if it was ever on a message base) and on KaZaA (to see if the song was available as an mp3) and was SOL on each search. Sorry. I tried. 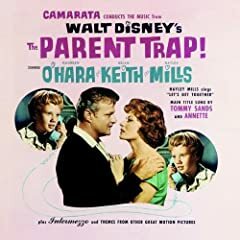 your best bet is finding the album "The Parent Trap/Intermezzo and Others" (BV-3309) which features songs from the movie. check ebay. A few years ago while flipping through the soundtrack section in a record store, I saw "The Parent Trap" printed on the spine of a CD in the row I was flipping through. For a split second, I felt that rush of excitement that you always feel when you find a long-sought musical treasure that you didn't expect to find. But, alas, it turned out to just be the soundtrack to the recent remake of the film. I recently read a USA Today article about the new Country Bear Jamboree movie, and it occurred to me that, like the new Parent Trap, this movie will probably have a CD soundtrack, while the original classic that started it all and made the remakes possible remains sadly neglected and nowhere to be found on CD. Kind of the same feeling I get when I flip through a stack of Pooh CDs and their is no "Many Adventures of Winnie the Pooh" soundtrack among them. Oh well, the 25th Anniversary DVD is due next month so hopefully this will inspire the release of the soundtrack. And maybe if the CBJ film does well someone will realize the actual park audio needs to be released and give it the green light. As for Parent Trap, hopefully if Pete's Dragon sells well it will open the door for other "older" live-action soundtracks that didn't seem to have much chance of release just a few years ago. It's kind of annoying having a thread on here with the initial posting deleted so that most of us don't know what song you guys are talking about. What gives? Yes, after the debacle, it's good that what we say stays here (even if it is wrong or misguided at times - er, that's me I'm talking about, by the way - lest anyone take offence). I take it that "in extemis" there are certain people ( ) who could delete and amend things if required and also a PM to that effect from the poster (with good reasons) would work? Absolutely. The easiest/best way to let an Administrator know that you need one of your posts edited/amended is to click on that post's button. Don't forget that you have 60 minutes after creating a post to make edits on your own. And yet there were complaints when I took away the ability to edit/delete posts. Those would be from me.